We've had fun the last week introducing two midwestern raised kids to the ocean! 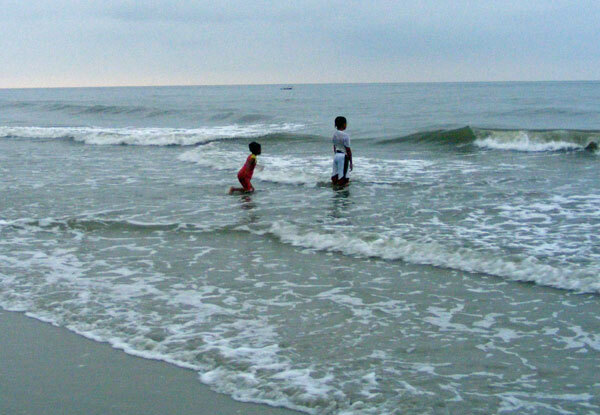 Here are their first steps into the Atlantic. They spent a lot more time in the ocean on floats and digging in the sand. We also played miniature golf, played lots of other games in the condo during the hottest part of the days, biked on Hilton Head's extensive golf paths, went canoeing, ate way too much, and enjoyed catching up with each other. I'm sure many of the other 192 (!!!) photos I took will find their way onto future scrapbook pages. My stepdaughter also took photos so I'm anxious to see those. I hope to be back to making cards some this week. My scrap space is in use as a guest bedroom for a few days but I bet I can find a way to do some papercrafts. I'm going through glue withdrawal!